Celebrating its 17th year, the 2019 Atlantic City Airshow will return to the skies above the beautiful free beaches and Boardwalk in Atlantic City. Enjoy free time on the boardwalk while observing some of the world's finest aerial demonstration teams. Thunder Over the Boardwalk is an annual airshow held over the Atlantic City boardwalk every summer. Since 2003, it has set the bar for beachfront airshows across the United States and is currently one of the largest airshows in North America. What sets it apart, aside from being a beach show, is the fact that it usually occurs on a Wednesday. It takes place along the beaches of Atlantic City, New Jersey, in front of the world famous boardwalk. There are plenty of casinos and shops along the boardwalk if you need to stay cool. There will be a rest stop enroute to Atlantic City. 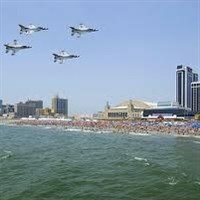 10:00 AM - 4:30 PM Airshow "Thunder Over the Boardwalk"